These three basics I knew, I loved, and I respected. Etched into my heart from Independence Days of the past. These were the principles I’d thrive upon. I didn’t know a lot, and maybe I didn’t know enough but I knew unity and faith and discipline. This year, let’s celebrate our country’s independence. This day is about us, our land, our self-determination, our freedom and everything else we wanted almost seven decades ago. Ever since I was a little girl, my grandparents have been telling me about the struggle they went through to get to this “Independence day”; for themselves, and for us. So put on your green and white clothes, wave your flags up high – bring happiness to a nation that so frequently lives in despair. When I think of the way my grandparents would recall their past, tearing up, it makes me emotional as well. I realised how hard it must have been for them to achieve independence for our generation, and how sometimes we take all their hard work for granted. It wasn’t all good though; they lost their belongings, their houses, their friends – but they gained a country. It’s easy to imagine ourselves in their place, but that is only fiction, not reality. Unity: My blood bleeds green for my people. I long for them to be one, and I know that someday, they can be. Patriotism can unite our people, and eventually lead the country into becoming the developed and established nation we all long for it to be. Furthermore, we should celebrate our freedom by keeping in mind all we have lost for this independence, even though we have been facing innumerable problems for a very long time and it is disheartening. Liberation – the word echoes freedom; when we talk about an individual’s liberation, we picture someone untethered and unaccountable to others. But a country’s liberation means more than that. We were granted liberation, but we are still not united. We are broken and chaotic, so this Independence Day, all I ask is, is unity that far away as a concept from us? Faith: Pakistan was built with the notion of bringing faiths together, for taking a minority and making it into a majority in a place that could be called home. If I picture my past, there are many small moments that stand out. But every year, I recall Independence Day the most. I remember celebrating it ever since I was a little girl, all the way up to university – each year more vibrant than the last one. I remember singing the national anthem, wearing a green and white Shalwar Kameez, waving a big flag around, and listening to inspiring speeches about our country. Mostly, I recall singing jeeway jeeway Pakistan, mera Pakistan he yeh tera Pakistan he, is parcham k saae tale hum ek hain, and ae rah e haq k shaheedon. These memories make me want to help the people of our country, regardless of their religion or cast. I always wanted to make my country proud. I remember that most, wanting to stand out in front of a big group of people, and show them what this land, this country, means to me. So I tried. I participated in all my school’s functions, regardless of what was asked of me – and today, I am grateful. Grateful that I partook in all these small moments of celebrating my country because those events precipitated in making me the patriot I am today. To those who claim Pakistan is a hopeless nation – don’t. Don’t lose your hope, your faith. Believe that our nation will survive through this. This is the time for change, the time to motivate our people. To those who claim Pakistan isn’t enough for them, and only celebrate Independence Day for the sake of celebrating – don’t. Don’t be a “nine days wonder” because your nation deserves more than that. It deserves your love, and kindness everyday of the year. Not just on the 14th of August. Celebrations should not be obligatory on a larger scale; instead we should take the small moments of celebration as the important ones; as it is us, the people, who can make our country a happy one. We are the ones that can show others that there is a reason to celebrate, that our beloved nation deserves our love and happiness. Discipline: Learn what’s right for your country, and follow that with all your heart. In school, I loved learning about our history. I recall seeing the vast map of the sub-continent, and my teacher telling me that the sub-continent was a place that harboured unity. That made me realise that Pakistan was created on the principles of unity, faith, and discipline, and one of the three cannot exist without the other. That’s why we should look to our past as an example of how people of different cultures, religions, and philosophies can live together. Our motherland should celebrate independence, the way the subcontinent celebrated unity. 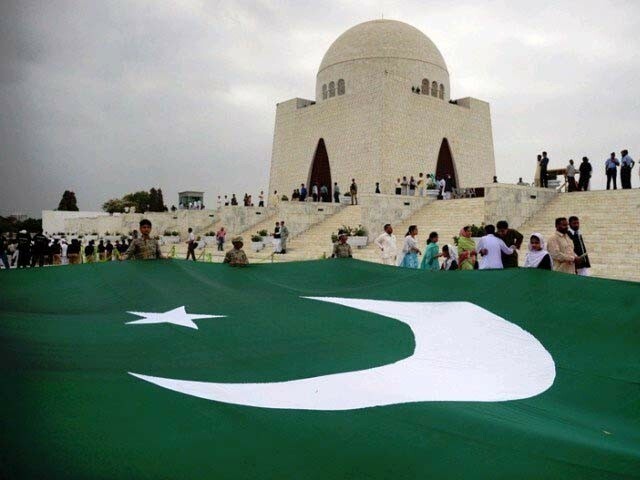 With one of the pillars, maybe the pillars of faith and discipline will come along too and someday we can wave our bright green and white flag under Teen Talwar, staring up at it in awe – because these are our morals, this is our country, and these are our people. I wrote this piece today because my grandfather reminded me of the importance of our wonderful nation once again. I hope this helped a little in reminding you too. Pakistan just needs to focus more on trade and less on fighting for its ideology, which means it should prefer making smartphones. For that policy to come about, the GHQ needs to retract from its ideology it has built since 1947.